Transform your TV + computer into a rugby league or rugby union scoreboard! Rugby Scoreboard Standard is an easy to use, cost effective, and professional scoreboard that will get your players and spectators engaged in the game. Combine our rugby scoreboard software with your computer and projector/display for a complete scorekeeping solution. PC Scoreboards are more versatile and less expensive to maintain than physical scoreboards. Our solution allows you to use different scoreboards for sport-specific functionality while reusing the same display. 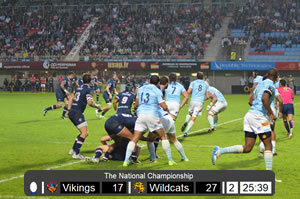 Download and try a free copy of Rugby Scoreboard Standard today. The Control Screen is an intuitive operator console for controlling the scoreboard. It includes 1-touch buttons and number entry fields for quick, easy, and error-free control of the scoreboard. This screen is a separate window that is only visible to the scoreboard operator, so spectators do not see mouse or keyboard input. Video player is an optional feature that allows you to play your own videos on demand on the scoreboard. Use this feature to display your sponsor advertisements, player intros, half-time clips, and more. Read more about video player. The optional web remote feature allows you to control all information on the scoreboard from any iPad, iPhone, iPod, tablet, smart phone, netbook, or most any device that has a web browser. After you have enabled web remote, simply browse to the URL listed in the options. There you can tap buttons to change scores, control the game clock, sound the buzzer, and more. The optional score banner screen allows you to professionally overlay the current scoreboard information on top of live or recorded video. The score banner screen allows complete configuration of scoreboard elements, size, position, and colors. The score banner can be overlayed using a user selected chroma-key color or floating window, providing you with flexibility for overlaying the score banner over game footage. Read more about score banner. Home and visitor team names and logos can be displayed. Customize the scoreboard sounds to use your own audio files. Select videos to play on the scoreboard. Configure the period and timeout durations to match the rules you use. Additional settings allow for customizing the functionality and appearance of the scoreboard. Configure the score banner's colors to match your team's colors and for optimal appearance over game footage. Customize the fields that display on the score banner and the order in which they appear. Choose whether to keep the score banner on top of other windows.